"I was very pleased with the friendly service. They repaired a favorite pair of earrings and beautifully re-designed another pair of earrings and all while I waited". 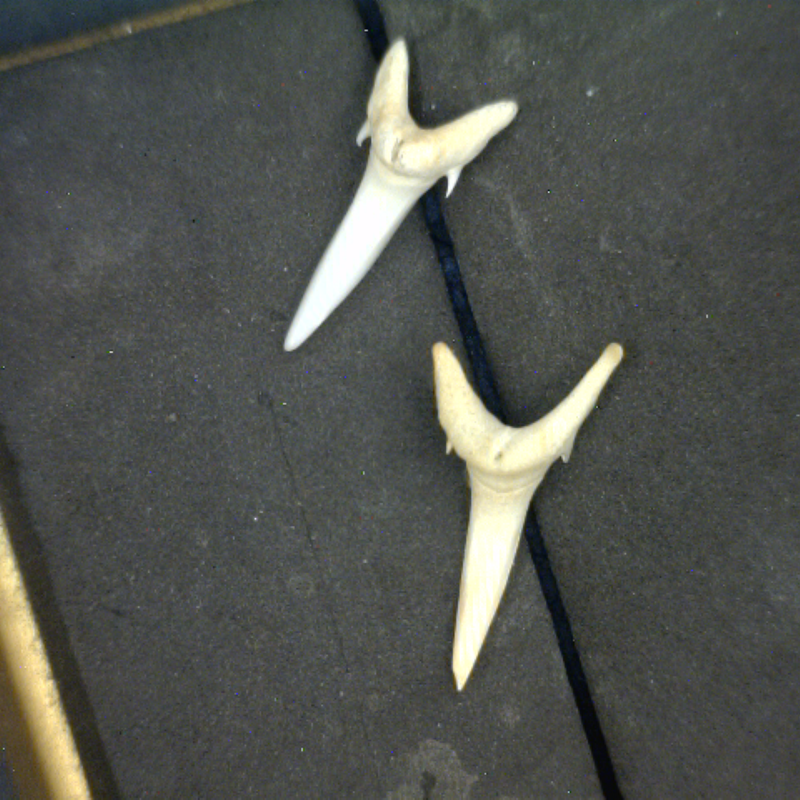 Four (4) shark teeth made into earrings. "I brought in four (4) SHARK teeth to be made into earrings. The 'doc' did an awesome job. He even texted me a picture when they were completed. Friendly & professional services. Always satisfied. Thank you for the lovely bracelet. I like it very much. Thank you very much for the work you did on my lovely engagement ring. Appreciate it very much. I would like to take this time to thank you n your wife so much for your patience in answering all my questions and the way beyond customer service you provided bringing my bracelets back to me after you repaired them. In these days of the 'almighty dollar' and fast paced movement of things - people not caring about others - only getting paid, it is a breath of fresh air! I know they may not be worth a lot of money but they have value to me. I really appreciate what you did. I met Tim when he came to Halifax. We needed his experience and knowledge of working with fixing jewelry. Tim is someone who is precise with his workmanship and knows how to please the customer. Tim is willing to do almost anything to make the piece of jewelry, what you want it to be, and it turns out better than you thought it would be when completed. Tim is someone you can always count on to complete the work as fast as it can be done. If you want the best job done and done correctly, you want someone with integrity, you want Tim. I would trust my most valuable possession, no matter how expensive, in Tim's care and know they would be taken care of. As more n more people meet Tim, I am sure they too will feel the same as I do. In general, Tim is always someone you can rely on and of vital importance to our community, not only as a person, also as a Great Business man. Located Tim via the Internet. First location Lewisberry, PA. I have been coming to Tim in Halifax for several years. His service is well worth the 2 1/2 hour drive. What I love about My Jewelry Doctor is that I can wait for my repair. He is a professional with a craft that is hard to find in our age of technology. Give me hands on and the personal friendship. I'm old school. Another plus is-"he is reasonable in cost." My family and friends give Tim high fives! Don't retire. I've never been so pleased. His work is fantastic.